Usually, when the news of yet another remake emerges amongst the already overwhelming masses of reboots, prequels and sequels, I’m the first to complain. Frankly, I find studio execs’ incessant desire to re-imagine nearly every popular horror film impossibly exhausting, especially when there’s such a wealth of indie filmmakers, waiting for their chance to shine. However, when I learned that the 1993 horror comedy Leprechaun was getting the reboot treatment, I didn’t feel the same animosity towards the project like I did when I read that other films I love would be remade, like Predator or Poltergeist. I enjoy Warwick Davis’ performance as the leprechaun, but I consider the early ’90s production to be more of a fun holiday viewing than an irreplaceable, iconic piece of cinema. By the time the rumors had spread that Leprechaun: Origins would be more of a monster than a drunken Irishman telling jokes, I was actually curious to see how newcomer Zach Lipovsky would tackle his first big directing gig. Unfortunately, the movie didn’t live up to the hype. In the film, four young friends travel to a remote area of Ireland for a quiet last day of their trip. Sophie, Ben, Jeni and David have been backpacking across Europe, hoping to experience a unique getaway. Casting aside the usual tourist destinations in favor of some less-well-known spots, the two couples wind up in a tiny pub in the countryside. While enjoying their pints, they meet a man named Hamish, who lets them in on an old secret location known as “The Stones of the Gods.” He tells them that there’s a cabin up the road where they can stay, and it’s a seven hour hike down a narrow path from there to the stones. The kids agree to the plan, and together they set out on their adventure. Unfortunately, the crew soon finds that this odyssey contains more excitement than they bargained for. The leprechaun itself seemed like a combination of past movie monsters. The body is very similar to the one in Pumpkinhead, with legs that echo the style of the faun in Pans Labyrinth, Predator heat sensory vision and clicking noises reminiscent of the ones in The Descent. The overall look of the leprechaun is actually pretty impressive, but sadly, there’s never a real full body shot of the beast. The few shots of the creature are blurred and rushed, which feels lazy and uninspired, like the filmmakers are ashamed of what they’ve created. Director Lipovsky clearly aims for a Jaws-like thriller, leaving the audience mostly in the dark for the majority of the film, allowing the fear to lie in the characters’ reactions. Despite this attempt to pay homage to a classic, Lipovsky should have known that even Spielberg shows the shark in the end. Also, with the overwhelming amount of shaky cam, and the fact that the leprechaun is never truly revealed in its entirety, the whole act becomes more frustrating than it is effective. The characters themselves are very static and unsympathetic. Besides the fact that Sophie, the history major, is dating Ben, the man who takes her for granted, and that Jeni and David spend most of their spare time with each other’s tongues rammed down one another’s throat, there isn’t much to them. 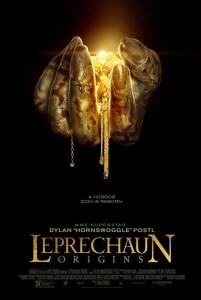 Between the lack of leprechaun sightings and absent character development, it’s difficult to maintain interest in the film for much of the time, even with the running time only lasting around an hour and fifteen minutes. There are a few exciting kills, with some quality gore, and decent cinematography throughout. However, overall, Leprechaun: Origins is awfully disappointing, and offers little insight as to how this prequel fits into the Leprechaun world, or how a grotesque creature of darkness could transform into a short man reciting riddles. Leprechaun: Origins opens in select theaters this Friday, August 22nd and hits VOD on August 26th.